Cappadocia is a region of fantastic scenery in central Turkey. A volcanic eruption covered the area in hundreds of feet of ash. That ash hardened into a soft stone, which then eroded into bizarre shapes. The material is soft and easy to dig or carve, and so the local people have excavated and sculpted homes and storage facilities through the millennia. Elaborate churches were created when this was a monastic center. When invaders threatened, entire cities were carved out undergruond. Cappadocia referred to much of central Anatolia back in the days of Herodotus. Cappadocia was the whole region from Mount Tarsus in the south, close to the Mediterranean, to the Black Sea in the north, and from Tuz Gölü or the great Salt Lake in the west, to the Euphrates River in the east. 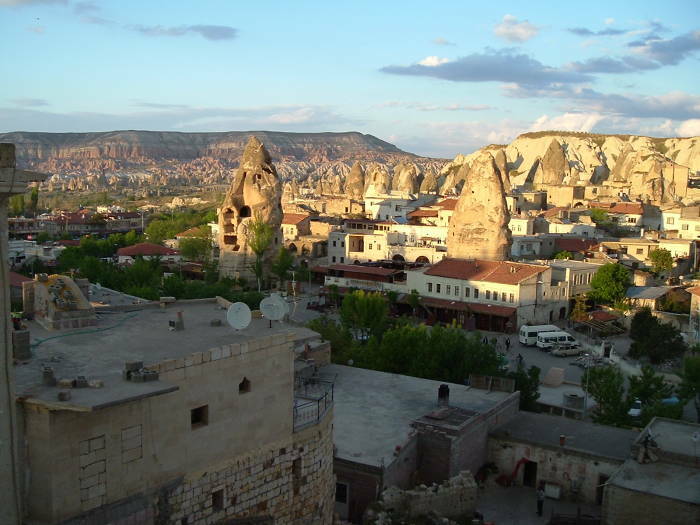 These days, the term "Cappadocia" more narrowly means Nevşehir Province, more or less. The Turks call it Kapadokya, the Greeks called it Καππαδοκία. There are records of its name back to the late 6th century BC, when it was listed as Katpatuka in inscriptions of the Achaemenid kings Darius I and Xerxes as a country of the Persian Empire. Whatever you call it, it's a region of fantastic scenery. Map of Turkey showing the Cappadocia region. Mount Erciyes is the highest mountain in central Anatolia, with its summit at 3,916 meters. 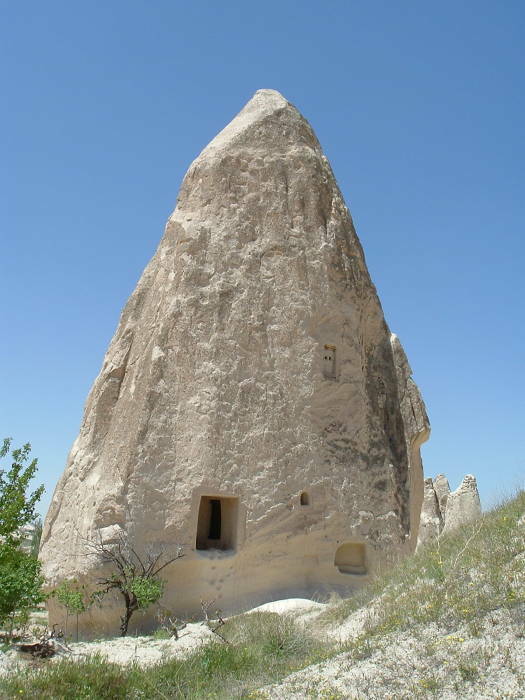 It is 25 kilometers south of Kayseri, well east of Göreme. Erciyes, or Άργαιος in the original Greek, is a massive volcano. Some Roman coins suggest that it may have erupted as recently as 253 BC. It's high enough that Strabo wrote that the summit was never free of snow and on days with clear skies at the summit you could see both the Black Sea to the north and the Mediterranean Sea to the south. Mount Erciyes erupted a few thousand years ago, covering the area under hundreds of feet of ash. The ash hardened into tuff, a very soft stone. Rocks and other hard chunks were embedded within the tuff, and erosion creates bizarre shapes as the hard material protects some of the softer stone underneath. And, for at least two thousand years, people have been carving homes, churches, and storage facilities into the tuff. 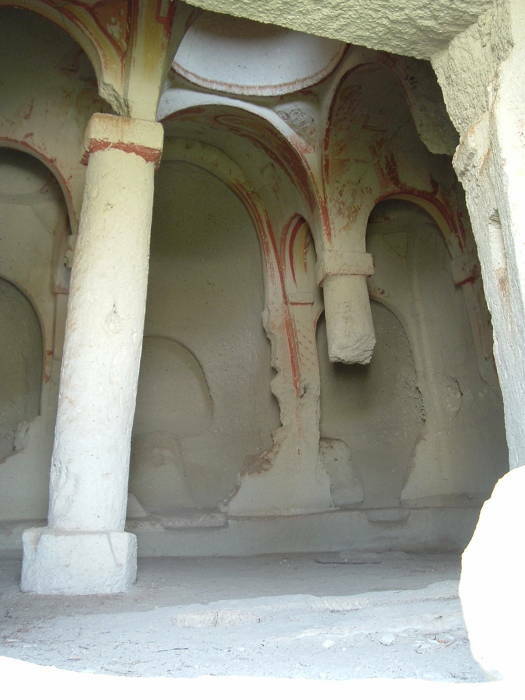 Most of the pensions in Göreme are at least partly carved out of the stone faces. You can live in a cave and have access to the Internet and satellite TV. Cappadocia is a high plateau above 1000 meters elevation. This makes for hot dry summers and cold snowy winters, with temperatures pretty extreme in both directions. Rainfall is sparse and the climate is semi-arid. 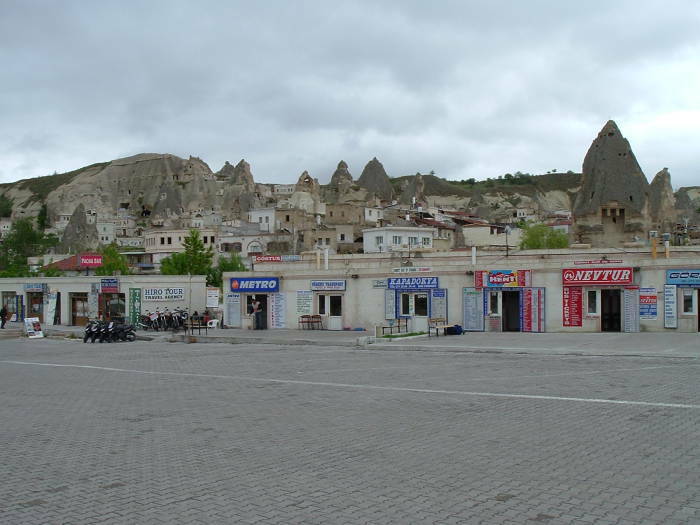 When you arrive at the Göreme bus station, you realize that it is a very different place. "Fairy chimney" formations loom over the town. Look closer and you begin to see what appear to be windows and doors cut into the cliff faces and the towers and cones. 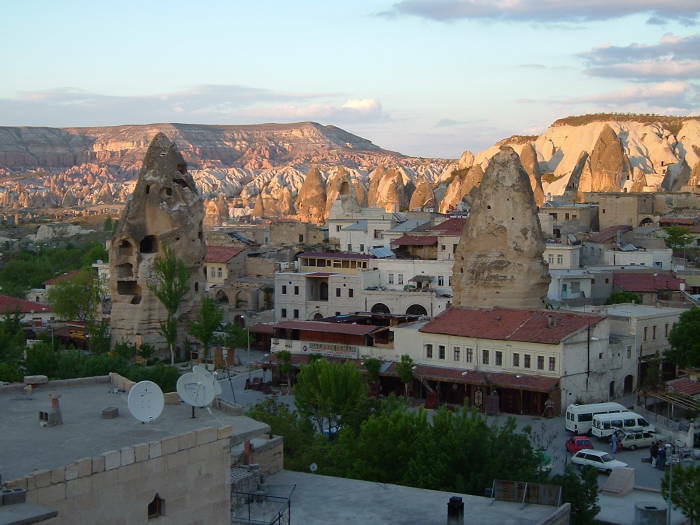 Your arrival in Göreme is quite peaceful compared to some other locations in Turkey. Pensions are not allowed to send people to meet the buses, so fresh arrivals are not enveloped in a scrum of pension touts. A tourism office at the station provides information on all the local accommodation. There is a detailed map with descriptions and pictures of your various choices. You can proceed in peace to the place you select. 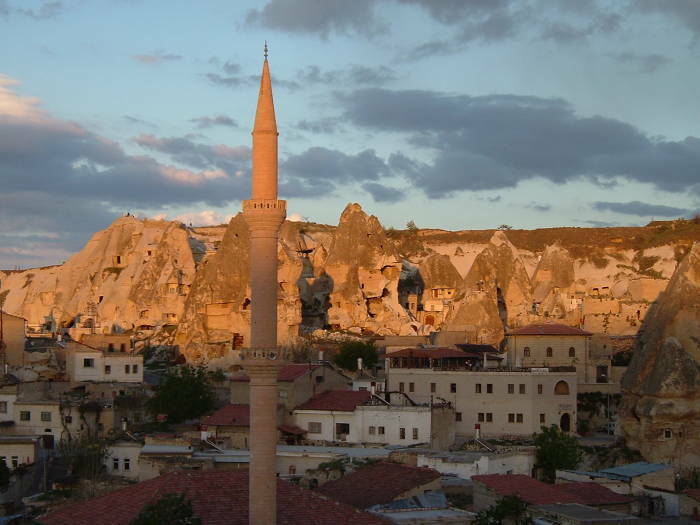 Göreme has a population of just about 2,500, so most accommodations are just a short walk away. You will probably have arrived on the highway from Ürgüp, to the southwest, passing some outlying camps and hotels on the valley rim overlooking Göreme. This highway winds through town and splits the "old town" back in the valley from the "new town" in the open flat area to its north. The highway then runs north across the open valley past the village of Çavuşın and on toward Avanos. The twisting road can leave you a little disoriented. Nicer pension locations are back up the valley behind the bus station, straight away or to the right as seen in the picture above. It's late afternoon and the sun is starting to set over the valley rim behind us. We're looking out from the patio of a locally owned pansiyon located back some crooked side streets and passageways. We're looking down over the center of Göreme. You can see some rooms cut into the large cone just left of center. People tunneled passages and rooms through this tuff cone over the past centuries. Then the continuing erosion eventually led to the loss of large outer sections, breaking the cone open and exposing a cross-section of the former dwelling and storage spaces. Strictly speaking, tuff is rock formed from consolidated volcanic ash. Tuff is sometimes called tufa when used as construction material, but tufa is really an entirely different substance, a variety of limestone formed by the precipitation of carbonate minerals from ambient temperature water bodies. Volcanos erupt a mixture of hot gases, lava, steam, and tephra. Lava is molten rock, while tephra is the general term for solid material blown into the air from volcanic eruptions. The tephra is made up of solid material in a range of sizes. Small enough particles, the size of sand or smaller, are termed ash. A thick layer of ash can consolidate or become a solid under its own weight. Large hard tephra lumps are embedded throughout the thick layer of ash. The infrequent and sparse rain is still able to easily erode the relatively soft matrix of consolidated ash. However, randomly sized and shaped solid tephra lumps resist erosion. They protect the ash underneath, directing the rainwater out and around. The result is frequently a shape roughly like a cone. Larger formations are conical at the top with their outline curving to a more cylindrical shape, something like a pointed bullet. Different layers are different colors, and some cones differ in color along their length. A red layer is visible in the distance in this picture, taken closer to sunset. The consolidated ash tuff is quite soft as rock goes, but it's strong if not cut too thin. 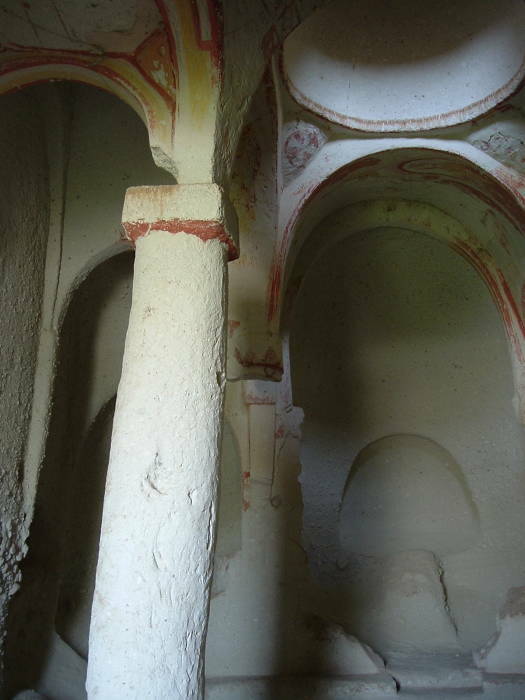 Many of the pensions in Göreme offer "cave rooms". Homes were typically built against the sloping valley walls, partially excavated back into the ground. Expansion for storage space, enlarging existing rooms, or even adding new rooms completely underground, just required a little more excavation. Rectangular blocks cut from the tuff could then be used to construct a regularly shaped exterior facade. Cappadocia was known as Hatti late in the Bronze Age, and came under the control of the Hittite Empire with its capital at Hattusa. It was settled back around 3000 BC. The Hittite Empire fell around 1180 BC, leaving Cappadocia under the control of an aristocracy who lived in fortified castles and kept the peasants poor and at risk of capture and foreign slavery. Cappadocia was part of a Persian satrapy under the Persian kings Cyrus and Darius in the 500s BC. Alexander the Great brought the Persian Empire to an end around 333 BC, and he tried to leave the region under the control of one of his military commanders. However, a Persian aristocrat managed to establish himself as King of the Cappadocians. In the period 130-63 BC Cappadocia came under the control of Rome. It was far enough away to vary its allegiance between Roman factions. It became a proper Roman province in 17 AD under the Emperor Tiberius, at the death of Archelaus, the last Cappadocian king. Rome fell, or really faded and collapsed a little at a time. Byzantium prospered, with the city being renamed Constantinople and the area under its control becoming the Byzantine Empire. Cappadocia became a frontier zone between Byzantium and first the Sassanid Empire, and then the Muslim conquests. The Turkish clans led by the Seljuk Turks began settling in Anatolia after the Battle of Manzikert in 1071. Cappadocia gradually became a tributary to Turkish states to its east and west. Some of the population began to convert to Islam. The Greek language persisted in some villages, although heavily influenced by Turkish and known as Cappadocian Greek. 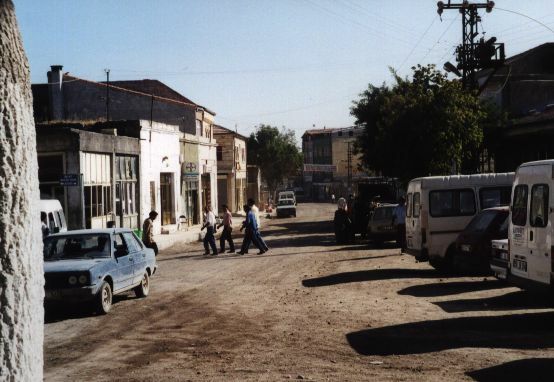 Other locals shifted to Karamanlıca, a Turkish dialect written in the Greek alphabet. The Seljuk Turks had taken full control of the region by the mid 1100s. The Konya-based Seljuk Turks declined and fell from power in the late 1200s. They were gradually replaced in power by the Beylik of Karamanoğlu, who in turn was replaced by the Ottoman Empire through the 1400s. The region remained within the Ottoman Empire through the end of its existence, becoming part of today's Turkish Republic. The 1923 population exchange between Greece and Turkey removed almost all of the Greek population, leaving Cappadocian Greek a dying language spoken by a very few descendants of the former population now living in Greece. It was thought to have been extinct since the 1960s, but several third-generation Cappadocians were discovered speaking it fluently in Central and Northern Greece in 2005. Here on the eastern valley rim above Göreme we see what was dug centuries ago as a multi-level "apartment complex". The lower levels have been renovated and probably excavated further, and recent tuff block exteriors have been built out from the natural face. Pensions now offer these cave rooms to visitors. Göreme was known in ancient Greek as Κόραμα or Kòrama. A town was settled here in the Roman period. The town was then known by a series of names as control of the area shifted between different ruling powers: Matiana, Maccan or Machan, and Avcılar. 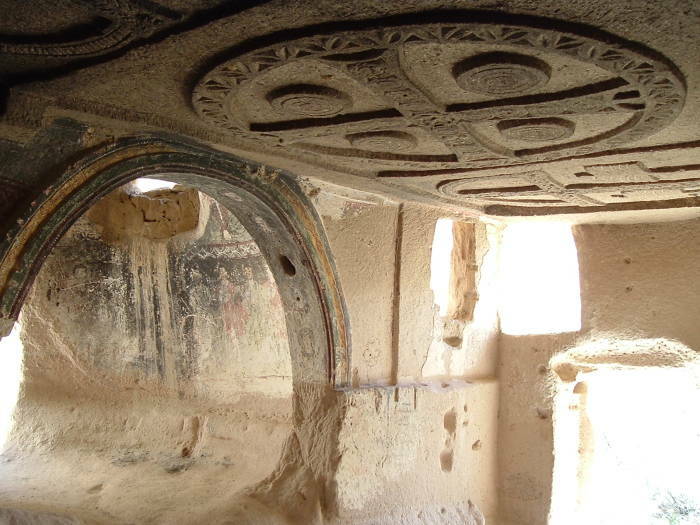 A cluster of well preserved ancient churches in the nearby Göreme Valley was established as a tourist location, and the town itself was renamed from Avcılar to Göreme. 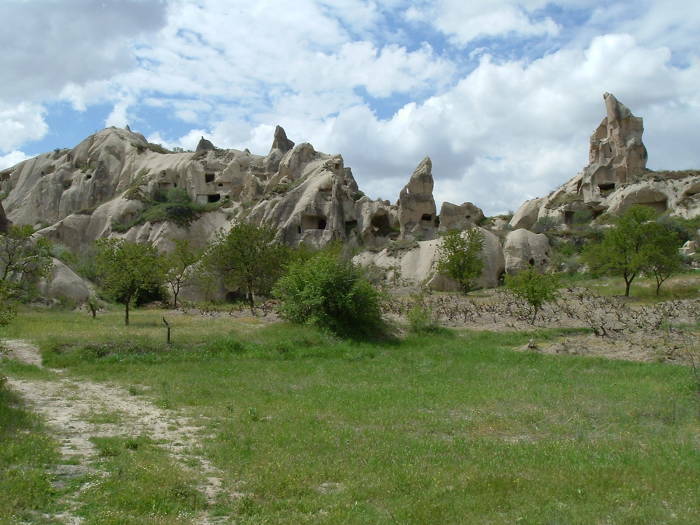 The valley became the Göreme National Park, and it was designated a UNESCO World Heritage Location in 1985. From Göreme it's 3.5 hours by bus to Konya, 10 hours to Denizli and Pamukkale, and 12 hours to Selçuk. 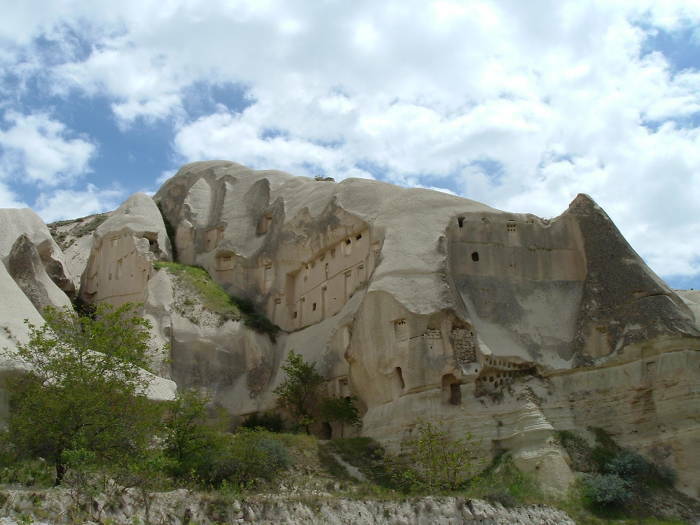 The carved complex below is just a short walk outside Göreme. 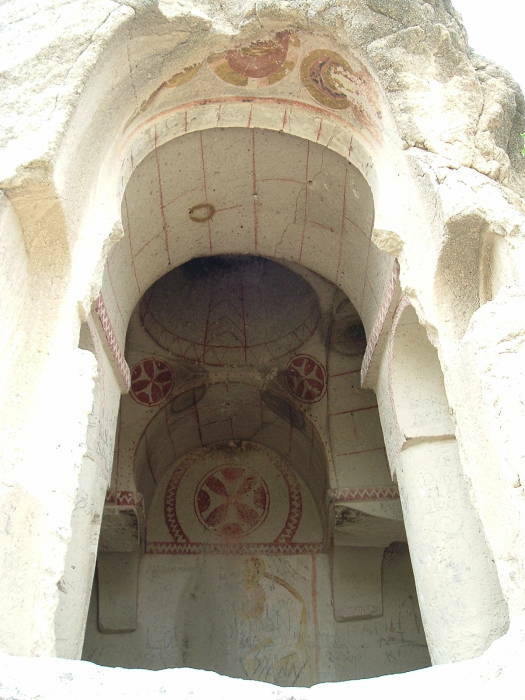 The Göreme area functioned as a monastic center over the period 350-1200 AD. Saint Basil of Caesarea (now spelled Kayseri in Turkish) instructed small anchorite communities to form in the region. Basil lived 330-379, and founded a monastery on the Iris River in Cappadocia around the year 356. He later wrote his Asketikon or the Rule of Saint Basil, a definition of the ascetic life. "Anchorite" is from the Greek άναχωρέω or anachoreo, meaning "withdrawn", often interpreted as "departed into the rural countryside". Anchorites withdrew from the security society to lead intensely prayer-oriented ascetic lives. Put another way, they were a form of religious hermit. Basil is known as one of the Cappadocian Fathers, along with his brother, Gregory of Nyssa, and a close friend, Gregory of Nazianzus. Basil, Gregory of Nazianzus, and John Chrysostom are collectively known as the Three Holy Hierarchs. They advanced the development of early Christian theology in areas such as the definition of the Trinity. GPS: between UTM 36S 0660308 4279388 and UTM 36S 0660493 4278910. This was a monastic center from the 350s through about 1200 AD. Many of the carved structures were created as small chapels and monastic retreats. Others were small chapels and larger churches. 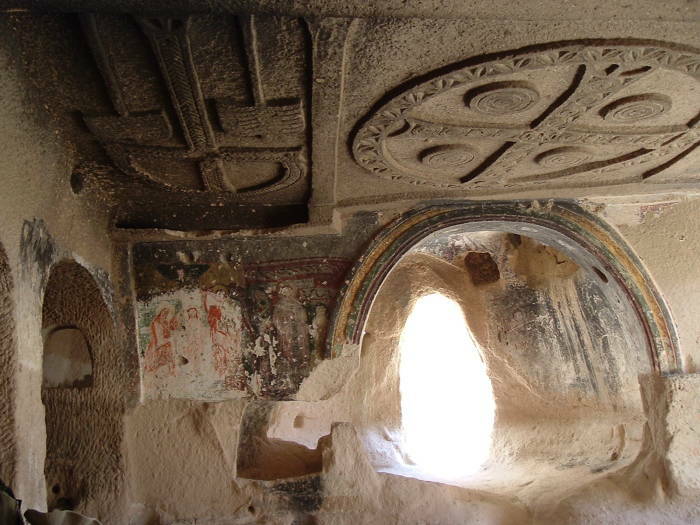 For example, the Göreme Open-Air Museum contains over 30 rock-carved churches and chapels. The multi-level complex seen here is just a short walk outside Göreme. The local people have bricked up many of the original openings over the following centuries, leaving only a series of small holes. The chambers were used for raising pigeons. The walls of the rooms would be carved to produce several rows of basket-like alcoves, pigeon roosts. This opening leads into a church carved into a cliff face. Thin red lines painted on the rock provide an illusion of the arches and domes being constructed from tuff blocks. However, all this was carved from the solid cliff face. A few fragments of painted figures remain on the heavily damaged outermost arch. Iconoclasm, Greek for "image breaking", refers to two periods when the Byzantine Emperors, backed by the Orthodox Church, imposed bans on icons or religious images. The bans were motivated by strict interpretations of the Ten Commandments forbidding "graven images". Iconoclasts believed that icons were unable to simultaneously but separately represent both the divine and human natures of the Messiah. The two periods of Iconoclasm were 730-787 and 814-842. 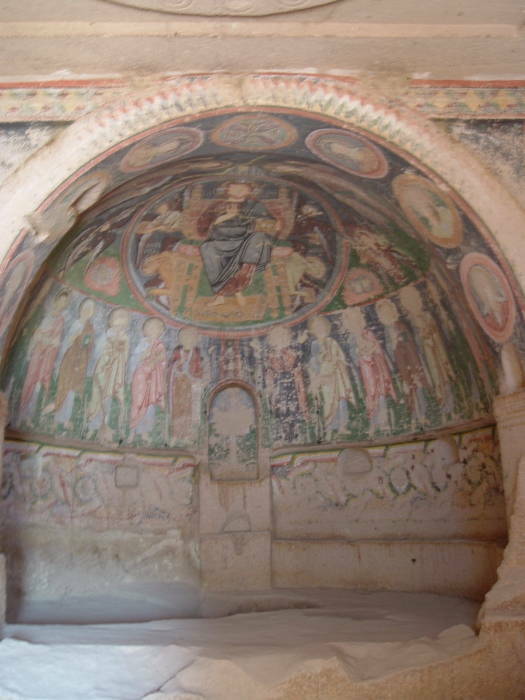 Images created before that time were destroyed, and new churches were built (or in Cappadocia, carved) in austere styles. GPS: UTM 36S 0660493 4278910. GPS: UTM 36S 0660617 4280510. This free-standing cone near the Rose Valley holds a small church. You have to climb up about 3 meters to the entrance. See the hand- and foot-holds? Much further up the cone you can see the opening into a former monastic cell. The anchorite monk occupying that cell would be put into place, and then his limited food and water supplied from below. This is the Church of the Three Crosses in the Rose Valley. The entire church was exavated out of the cliff face. Its decorative reliefs of three crosses were cut into the ceiling. GPS: UTM 36S 0660902 4280569. 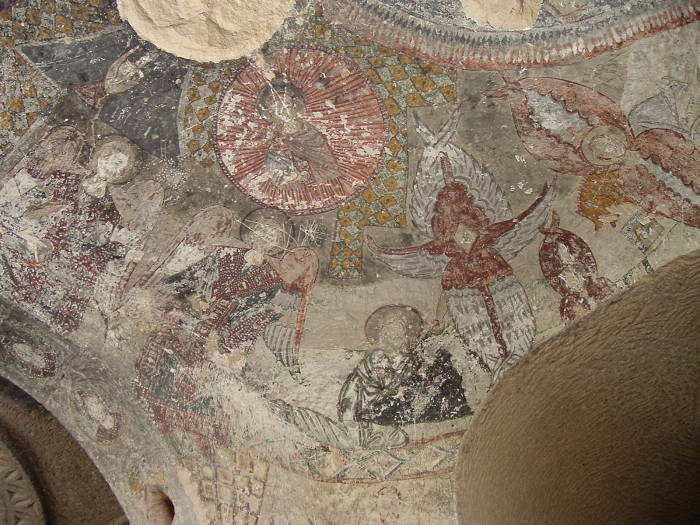 These battered frescos are in The Church of the Three Crosses. 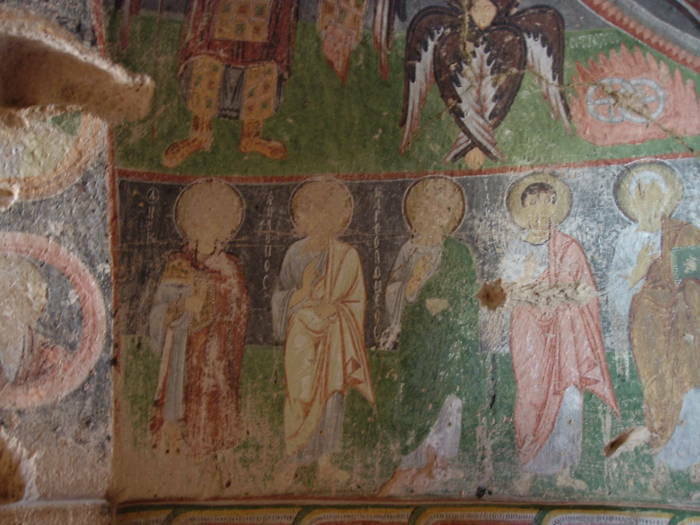 Frescos were added to churches after the end of iconoclasm in 843. These are two of the three crosses in the Church of the Three Crosses. The one at our left extends up between two palm trees. The one toward the center is of an equal-armed Maltese design. We are continuing further up Rose Valley beyond The Church of the Three Crosses. The "fairy chimneys" soar into the sky. Rose Valley is named for the pink color of the stone in this area, caused by a slight increase in iron oxide in these deposits. GPS: UTM 36S 0661382 4280509. Haçlı Kilise, the Church of the Cross, is on the north rim of Red Valley. It is in the cone at right here. You climb a wooden ladder into the entrance area, pay a nominal entrance fee (apparently a mixture of governmental fee and baksheesh), and enter. These beautiful frescos are in Haçlı Kilise, the Church of the Cross. 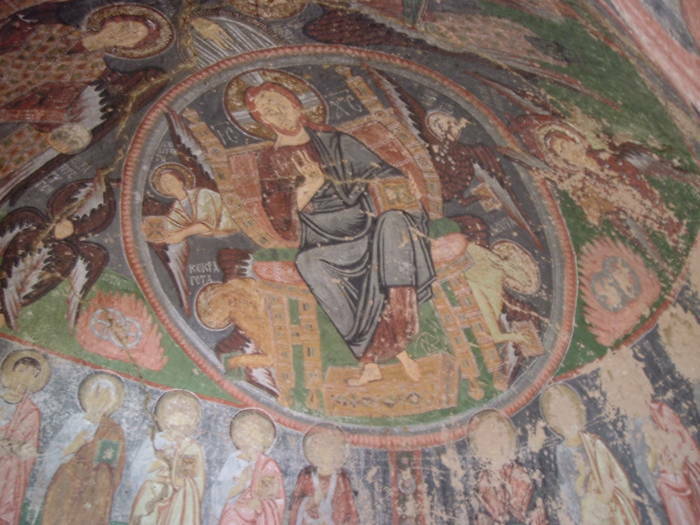 Above and below you see a Christ Pantocrator image, or in the original Greek, Χρίστος Παντοκράτωρ. The altar area in Haçlı Kilise, the Church of the Cross, has the Christ Pantocrator above, a row of apostles and saints below, and a series of roundrels of apostles and saints along its outer edge. They are labeled in Greek: Andreas, Bartholomaeus, and so on. I called the church seen below Kilise Dört Sütunlu, or the Four-Columned Church. I didn't see any name for it on any of the rather sketchy maps for the area. 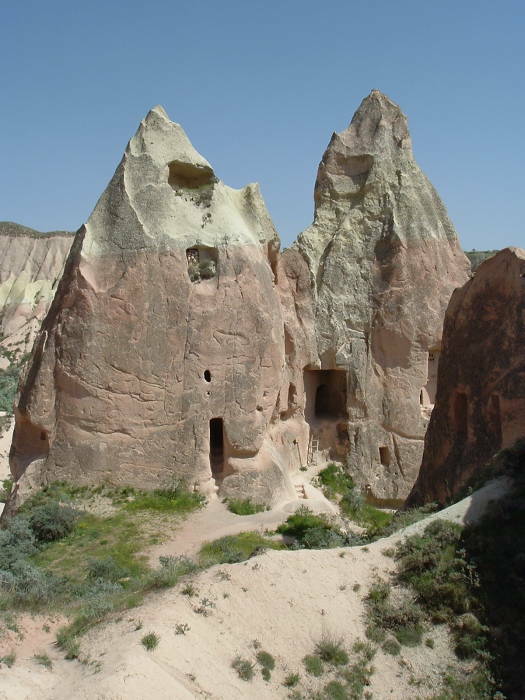 The guest houses in Göreme can give you a map, but it does not have a lot of detail. This is at GPS location UTM 36S 0660113 4278618. GPS: UTM 36S 0660113 4278618. 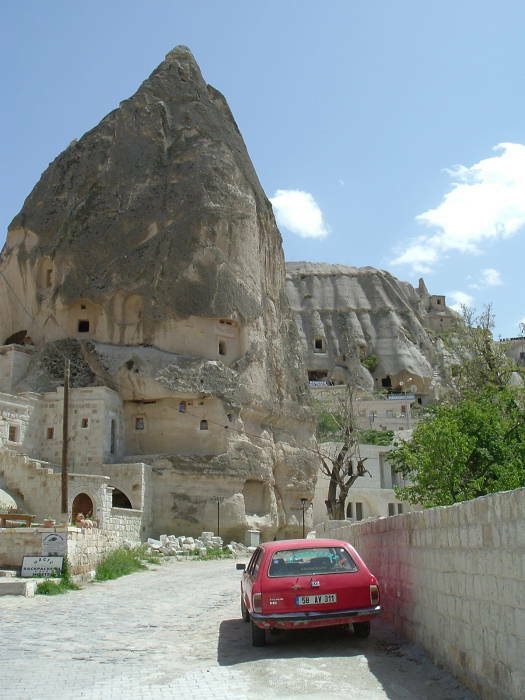 Like all the other Göreme churches, Kilise Dört Sütunlu was created by carving into a cliff face of tuff. What appears to be the interior design or construction is created by carving away material. These aren't so much columns, arches and domes as the result of cutting away everything except the columns, arches and domes. 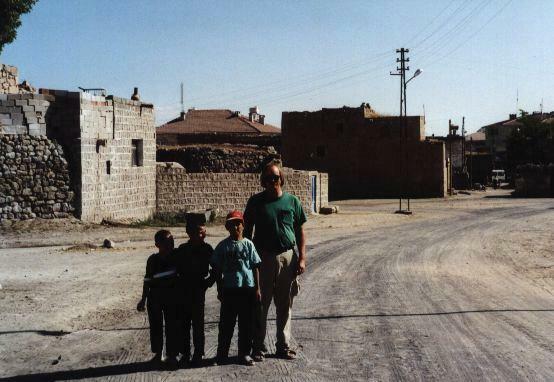 The nearby farming town of Derinkuyu looks like any other central Anatolian farming town. However, it has what appears to be a subway entrance, very much out of place! That leads into an entire underground city dating back to Hittite times, and occupied over centuries. Derinikuyu's underground city is one of a number in the region. The Derinkuyu underground city has eleven floors extending to a depth of approximately 85 meters. It was large enough to house between 35,000 and 50,000 people and their livestock. It included wine and oil presses, stables, cellars, storage rooms, refectories, and chapels. The Derinkuyu underground city may have been started by the Phrygians in the 8th to 7th centures BC. It was then a hiding place for the early Christians. It was opened to the public in 1969, and so far only 10% of its area is accessible to tourists. 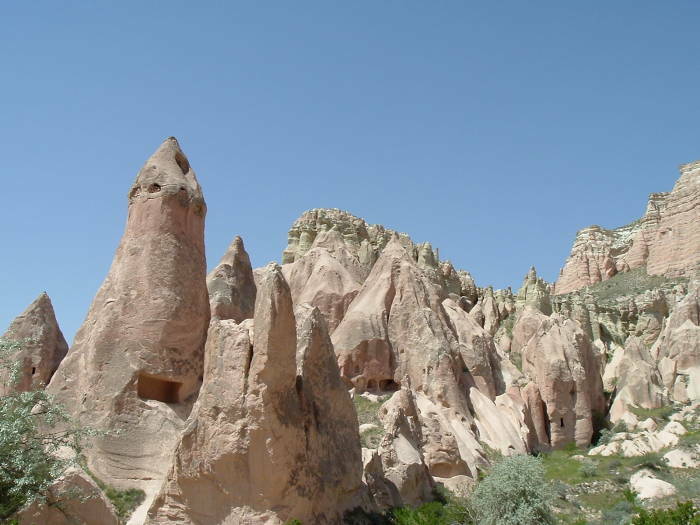 Over 200 underground cities with at least two levels have been discovered in the area between Nevşehir and Kayseri. Forty of these have three levels or more. Xenophon wrote about underground cities in his Anabasis. He wrote that the people of Anatolia had excavated their houses underground, living well in accommodations large enough for the family, domestic animals, and supplies of stored food. A 1975 study of three small villages in central Cappadocia discovered that 50% of all deaths were due to a form of lung cancer usually associated with chronic exposure to asbestos. It was first thought that a similar mineral known as erionite was responsible, but further study showed that the disease appeared mostly in families with a genetic predisposition to carcinogenesis driven by mineral fiber exposure. The families had the bad fortune of having this gene and then settling in an area where the mineral was common.